If you thought the lightweight aluminum air cargo pallets were valuable, you are going to be blown away by the advantages of the newest invention in the air cargo industry – the Air Pallet. AIRDEX International is one of the companies that manufacture these unbelievable pallets and they are committed to minimizing their carbon footprint while providing companies with the lightest air cargo pallet on the market. Weighing in at an average of 7lbs, this pallet is approximately 5lbs lighter than its competition. Airlines charge companies by the pound when shipping goods, so it makes no sense to use a heavy pallet to place your shipments on. Why pay the extra cash to use your own pallet? This air cargo pallet is designed to perfectly fit on airfreight like a cookie sheet and pays for itself in a single use. What composition allows these advanced pallets to be so light and efficient? To start, the outer skin is made from EPA/FDA/Medical certifiable high-impact polystyrene. This material is a tough, sanitary, non-porous and non-absorbent completely washable surface free of nesting places for insects, rodents, disease, mold, and mildew. Its inner core is produced from lightweight expanded polystyrene, which is a natural thermal insulator. It is extraordinarily light and shock absorbent, eliminating the need for bottom thermal wraps and fumigation. Even though this air cargo pallet is extremely light, it can support the same heavy and demanding loads of your typical aluminum pallet. They are strong and rackable, making these pallets the ideal shipping solution for companies looking to save money and increase profits. So what happens if the Air Pallet is damaged? If only slightly damaged, these air cargo pallets only require a simple, quick, and low-cost patching repair. If abused beyond repair they are sent to grinders to become raw materials for new plastic products. Always keeping the environment in mind, almost all Air Pallets are collected after their first use as part of a worldwide recycling program. They are extremely easy to use, clean, and repair. Ideal for fragile or temperature-sensitive products, these air cargo pallets will lighten your financial load while decreasing your company’s overall carbon footprint. That sounds like a win-win to me! If your company sends parcels via airplane often, then you know how important aluminum air cargo pallets are to your shipments. Airlines charge companies by the pound, so it is imperative to minimize your shipping costs as much as possible. There is an effective light weight aluminum air cargo pallet available on the market and it is in high demand. This pallet resembles a wood pallet but comes with a number of added benefits wood and steel pallets cannot offer. They are sometimes referred to as “eco-pallets” due to the recyclable materials they are composed of and their high scrap value. Weighing in at roughly 10 pounds, these pallets are extra light to ensure lower freight costs and carbon dioxide emissions. Durable enough to withstand heavy forklift use, they can be easily handled by one person and provide zero risk of injury from nails or broken wood. These uniquely engineered aluminum air cargo pallets never need fumigation because there are few (if any) niche harbors for critters and bacteria to live in. They are also temperature resistant and fireproof, which helps companies reduce their insurance rates. Due to their high tolerance to extreme temperatures, they are ideal for the food industry where items need to be kept in refrigerated storage for long periods of time. Virtually unbreakable, these aluminum air cargo pallets are non-corrosive and always look brand new. Instead of brittle rivets, clamps, or fasteners, the eco-pallet has robotic welds to ensure a quality, long-lasting product. The eco-pallet is completely customizable – you can even design your own! Typically, there are four types of these pallets: one-way, reusable, clean factory, and box pallets. They are also available in nestable and rackable styles with 2- or 4-way forklift access. The non-magnetic aluminum causes for a defectless electronic product that is perfect for electronic product manufacturing. Would you like to lower your company’s carbon footprint? Buy one of these aluminum air cargo pallets! As explained above, they improve your business supply chain and operations, are elegantly designed, and are a low-cost alternative. Why not save time, money, and labor on these great pallets? To begin, you will need to decide on a valid restraint system for your air cargo straps. This is simply a mechanical device (called a winch) set in place to help you adjust the tension of the straps. Winches come in a variety of styles. First, there is a weld-on winch, which is mounted permanently in a fixed position. Then you have a portable winch that can be placed anywhere along the trailer side rail. For more complex winches, there are sliding and lashing styles. Sliding winches move easily in both directions and fasten in place once pressure is applied to the webbing (they also have the option of being welded in place). Lashing winches on the other hand are bolted to a trailer and work best with a ratchet buckle due to their quick release capabilities. Cam Buckle: A cam is a small rotating or sliding piece used to push down on the webbing. Its edge is usually knurled (patterned), which allows for a better grip. Over Center Buckle: This is a slightly more complex threading procedure that uses a tensioning method to fasten easily. When the fastener is “open” excess webbing can be fed through the buckle; when “closed,” tension is added to hold the buckle in place. Ratchet: A ratchet is the most complicated type of hardware. It functions like a socket wrench and takes up the slack in the webbing and tensioning the assembly. So what’s the bottom line? There is more to air cargo straps than just the specific width and material. Choosing the right restraint systems and fasteners can make all the difference when protecting your shipments. So, take the time to explore your options and really assess your load to determine which tools you will need to attach to your air cargo straps. RFID (Radio Frequency Identification) is a unique wireless non-contact system that uses radio-frequency electromagnetic fields to transfer data from a tag attached to an object, for the purposes of automatic identification and tracking. Some tags require no battery and are instead powered by electromagnetic fields, while others use local power sources to emit radio waves. These tags store information electronically and can be read from up to several yards away. RFID is implemented in many industries. Pharmaceuticals apply them in their warehousing to keep track of stocked items. Tags are injected in livestock, allowing the animals to be positively identified. Even the automobile industry uses RFID to detect and retrieve stolen cars or bill motorists for access to toll roads. There are endless opportunities with RFID, and the air cargo business has begun to apply them to ULDs for easier tracking and tracing. A major problem the airlines face is their present ULD tracking system. Currently, the airlines face hardships such as human error (human intervention is required to read and record the ULD number by a UCM) and lack of centralized data. There is no way to reconcile a ULDthat leaves the system at one airport and reappears at another, and this causes big problems. Although airlines were late to adopt the RFID tags, they now use them on ULDs, passenger baggage, TD cargo shipments, and ground handling equipment. Attaching an RFID tag to a ULD allows airline personnel and customers to track the baggage at several airports and airlines through common Internet applications. ULDs equipped with RFID tags are automatically registered at points where liability changes hands. This is extremely important to airlines. Air France and Lufthansa alone lose 5-6% every year of their ULD inventory, amounting to hundreds of millions of dollars. If they attached RFID tags, they would know the last known location of the ULD and most likely find the containers. The implementation of these tags leads to higher transparency between logistics providers and airline carriers, ensuring quicker clearance through US customs. Unlike barcodes, RFID tags do not need to be within line of sight of the reader and may be embedded in the traced object. In order to work efficiently, RFID must be used within the entire supply chain. The tags provide distributors and customers with constant updates and reliable data regarding their shipments. By attaching RFID tags to ULDs, loading and unloading processes are accelerated and the risk of improper loadings is reduced. If you would like greater control over your shipments, RFID tags are the perfect solution and will always keep you updated. TOTALPACK is proud to announce that we are currently offering air cargo nets at a special price. Air cargo nets are used to hold large shipments on pallets in place during transit. The nets connect to the sides of the pallet and ensure your large shipments arrive at their final destinations unharmed. They are one-piece, knotted and adjustable. Our air cargo nets are a woven mixture of polyester and nylon rope and have been the net of choice for world leading cargo airlines for over thirty years. Made only in the United States, these air cargo nets have significant advantages over any other product. The woven rope is stronger, lighter and less likely to snag because of its extremely tight weave. The knotted construction also prevents the net from unraveling if a cord happens to break. All of our air cargo nets are treated with an abrasion resistant coating that greatly extends the average service life. They are lighter than many comparable cargo nets, making handling effortless and lowering your overall operational costs. Not to mention they are uncomplicated, faster and less expensive to repair than spliced nets because all repair intersections are knotted rather than picked. The air cargo nets can be repaired in the field using FAA Certified Bridge Strap that bridges broken diamonds. They are available in many different colors to make identifying and tracking your air cargo net much easier. Satco, Inc. first introduced the all-metal pallet to the industry in 1968. Since that day more than 40 years ago, they have been the only ULD manufacturer – main and lower deck cargo containers, pallets, nets, and straps – under one roof. The company is partnered with Alcoa, the world’s leading producer of aluminum, and features environmentally friendly aluminum alloy materials in all its containers and air cargo pallets. Satco is one of the suppliers TOTALPACK utilizes for delivering quality aluminum air cargo pallets. These pallets are ideal for shipping large packages and bundles long distances. The aluminum air cargo pallets TOTALPACK carries are fairly large in size to accommodate your largest cargo load. They range from 5ft x over 10ft to 8ft x 20ft, so they provide plenty of functional space. The cost of purchasing a brand new aluminum air cargo pallet can be expensive, so TOTALPACK keeps this in mind – we offer used pallets for about half the price. They are still in great condition, fully functional, and are an excellent option if you are looking to cut costs. Aluminum Alloy: Satco manufacturers cargo pallets with 7075-T6 aluminum alloy (78,000 psi) that is 38% stronger than the 7021 aluminum alloy (56,565 psi) commonly used by European manufacturers. Sheet Thickness: The thickness of the top and bottom is 0.16 inches (4.06mm). This is the standard single sheet pallet sheet thickness. When used with stringers in between top and bottom sheets, it makes an extremely rigid and strong platform on the top and durable rolling service on the bottom. 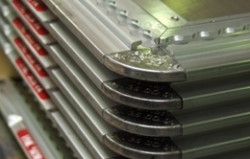 Reparability: Because the pallets are mechanically fastened and no adhesives or filters are used, the Satco pallet is easier to repair using standard metal techniques. Other big heavy-duty pallets on the market are not easy to repair due to their size and weight. Holes to the top or bottom sheets can be cut out using a hand router and damaged stringers can be repaired or replaced. Edge rails can be replaced without interference with the center structure of the pallet by removing pull rivets at the top and bottom sides of edge rails. Durability: Past tests have proven that Satco’s pallets can withstand up to 50,000 pounds of weight at its center. Although the pallet deflected slightly, the pallet passed the test with no damage. Long Established Usage History: Virtually all the major cargo carriers have used these aluminum air cargo pallets worldwide. Of course there are pallets available that are less expensive and lighter, but there is no pallet commercially available that has a lower overall cost of ownership when you factor in its life expectancy and low repair burden. For quality you can trust, commit to one of our Satco aluminum air cargo pallets. You cannot go wrong with the features these pallets offer and the great life expectancy they provide. Check them out here! Loading a vehicle or heavy object on a trailer is typically a fairly easy process, but making sure it’s secured correctly is another story. You want to make sure the object being towed is tightly mounted to the trailer, otherwise you could loosen a strap and lose the load. For that, you use air cargo straps. These tie-downs work great for securing a load to an aircraft, to a trailer, or to a hand truck. Using them correctly is pretty easy; it’s just a matter of technique. 1. Look at the object that you want to secure and start to figure out a plan of action. The goal is to make the object being moved and the object doing the moving (pallet, truck bed, etc) one solid unit. By doing this, you minimize damaging the object in transport, and also lessen the risk of loosening a strap because the object moves. To do this correctly, find a space to tighten the load to on the pallet. 2. Secure one hook of the air cargo strap to the tie-down on the pallet or trailer bed, and wrap the strap around the load. If you’re moving a vehicle, wrap the strap around a suspension point such as the axle or lower control arm, or just hook the other end of the air cargo strap to a suspension point. If it’s an object, connect the other hook to another tie down point on the pallet or trailer. 3. Locate the ratcheting mechanism on the tie-down strap. It’s a handle with a barrel in the middle, which the strap wraps around. Place your hand on the handle and pull it in the opposite direction, then back down. This is going to pull the air cargo strap into the barrel, so if you see excess strap, make sure to line it up as you’re ratcheting using your free hand. Continue ratcheting until the strap is tight, and then pull back on the handle really hard to secure the load. Wrap any excess strap around the rest of the strap and tie in a knot if necessary. 4. Repeat this process for any additional cargo strap you want. If this is on a vehicle, you want a cargo strap to be on each corner, pulling the suspension point away from the center on all corners. This way, if one strap fails, the others will keep it in place. Apply the same method for an object that you’re carrying, by orienting the straps to pull in opposite directions. Below is a detailed video on how to use a ratchet. This will help speed up the process of securing the air cargo strap to your shipment. ULD stands for unit load device, which is a pallet or container used to load luggage, freight, and mail onto aircrafts. 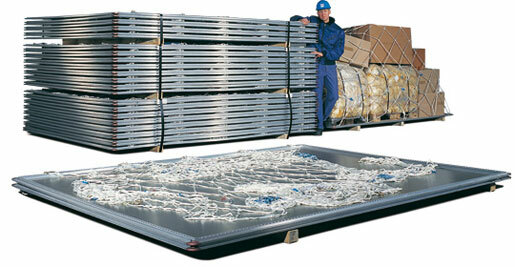 If the ULD is a pallet, it is most likely made from aluminum sheets equipped with rims to lock onto cargo nets. Once loaded, the shipments are wrapped with shrink-wrap or tied together using cargo nets. A container – sometimes referred to as a can or pod – is a closed ULD framed with aluminum. Depending on the items being shipped, these containers could have built-in refrigeration units or Lexan walls (a type of thermoplastic). Why are unit load devices so important? ULDs are an efficient way to ship bulk packages domestically or internationally. Large quantities of cargo can be bundled in a single unit, making it less likely to get lost or improperly manhandled along the way. These devices save crews time and effort, not to mention help prevent delays. Another plus to using a ULD is the balanced loading it provides. Instead of warily stacking box on top of box and praying they don’t shift in transit, ULDs offer support and organization for your packages. Before you purchase your own unit load device, it is very important you know where you are shipping items and how much space those items will occupy. ULDs are unique because they are built based on the availability of space in an aircraft body. Once the smaller packages are loaded onto the pallet or container, the shipment should be shrink-wrapped starting at the base. After that, adhesive and labels are applied to the outer surface and the shipment is numbered to guarantee a safe delivery. There are different specifications depending on where your package’s final destination is. If shipping domestically, you are free to use a regular pallet or container. However, if you are planning on shipping internationally, you must use a heat-treated or plastic pallet and bind it twice with ties after it is wrapped. If you fail to bind the ULD, it will not be loaded on the aircraft, and thus not delivered. Shipping large packages can be tedious and stressful, so anything that makes this process a little smoother is extremely valuable to your company. ULDs have an impressive reputation and are the most secure option when transporting large quantities. Next time your company is looking to send items via aircraft, a ULD is definitely an excellent option to ensure the shipment arrives unharmed at the final destination.